Elliot Daly (right) scores England’s winning try against Wales. 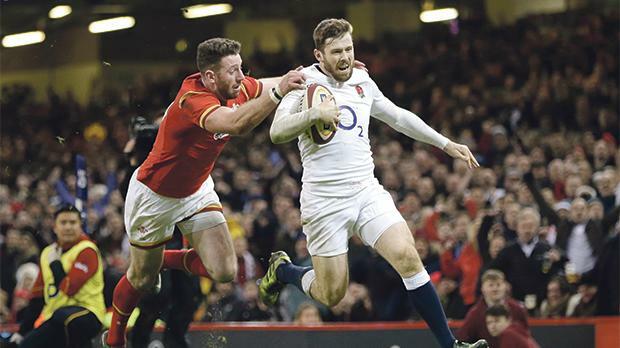 Elliot Daly’s try four minutes from time gave champions England a 21-16 victory over Wales in a pulsating Six Nations clash played at relentless speed amid an amazing atmosphere at Cardiff’s Principality Stadium yesterday. England’s 15-match winning streak and hopes of a repeat grand slam looked over as they trailed late into a game which an inspired Wales dominated, but an errant clearance by Jonathan Davies allowed England to counter and Daly scuttled over in the corner. They now top the Six Nations standings after two wins and with home games to come against Italy and Scotland before a last-day trip to Ireland, a second successive grand slam looks entirely achievable. “We used all our get-out-of-jail cards there,” said England coach Eddie Jones. It was match played at a level of pace and energy rarely seen in the Six Nations, and both sides managed to maintain it for almost the entire game. After an early penalty apiece England claimed the first try when, after a move of 26 phases with lightning recycling, they went wide and stretched Wales enough for scrumhalf Ben Youngs to burrow over after 18 minutes. Wales duly switched to attack mode and were in control for the rest of the half, though they could and should have turned round with more than their 13-8 lead after captain Alun Wyn Jones turned down two kickable penalties and lost possession on both occasions. Wales’s impressive scrum did finally open the way just before half-time though, shoving England backwards and making space for winger Liam Williams to run a great line for a try that Leigh Halfpenny converted. There was no let-up in the second half with the ball fizzing around like a sevens game and Wales still making the more incisive breaks. Another penalty apiece made it 16-11 to Wales going into the final quarter and a 70-metre Dan Bigger interception run from his own line lifted the home crowd to new levels of delirium. England, buoyed as last week by the energy of Haskell and fellow replacements Ben Te’o and Danny Care, came again but brilliant Welsh defence forced a turnover on their line. The home fans rose to acclaim what they felt could be the match-winning moment but the roar stuck in their throats as Davies failed to find touch with his clearance and his shattered team-mates were unable to muster any sort of chase. England did not need a second invitation, tearing forward into the space to send Daly over in the corner before Farrell showed his usual ice-cool nerve to convert and keep the double grand slam dream alive. Ireland recorded their biggest ever Six Nations victory as they smashed Italy 63-10 in Rome, running in nine tries and earning the tournament’s first attacking bonus point. The 2015 champions rebounded from a narrow loss against Scotland last week in Murrayfield and earned their four-try bonus point in barely 30 minutes, with blindside flanker and man-of-the-match CJ Stander scoring the second of three tries. Substitute winger Craig Gilroy also scored a hat-trick late in the second half, with Irish winger Keith Earls running in two tries and Garry Ringrose also crossing the chalk. Italy were awarded a penalty try.